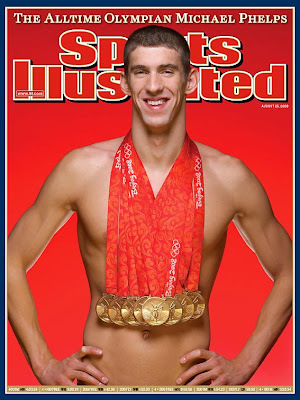 I was standing up for Michael Phelps because although he engaged in poor behavior by smoking weed at a college party ("Michael Phelps and My Alma Mater"), he made the right decision with the apologetic statement he released the day after his bong photo was published in a British tabloid. Initially it looked like Phelps would come out fairly unscathed after major sponsors stood by his side, but today not only did Kellogg drop his endorsement but the biggest blow came this evening when he was suspended by USA Swimming. The sport's national governing body has suspended him for three months. Bad news for Phelps; good news for Charlotte. Phelps will still be allowed to train, but he won't be able to compete in any events for three months, during this all important time leading up to the World Swimming Championships in July in Rome, when other swimmers are getting in game shape. Whereas he had planned to compete in a Grand Prix meet in March in Austin, Texas, he now won't be eligible to compete in a Grand Prix meet until the Charlotte UltraSwim, which takes place here May 14-17. The increasingly popular USA Swimming sanctioned event is hosted each year by SwimMAC Carolina. You can read an article I wrote about SwimMAC in this month's issue of Charlotte magazine ("Making a Splash"). Phelps has competed at the Charlotte UltraSwim in several years past--he holds three meet records--but this was all before his triumphant eight gold medals at last summer's Olympics. If I was a betting man, I would have said he would've skipped over this year's Charlotte event. But now, I'm betting that he's not only going to come but he's going to have a chip on his shoulder from all of this controversy, having his good name tarnished, and having to train for three months without being able to compete, so much so that he's going to blow the other athletes out of the water. And if he comes to Charlotte, I would expect lots of media coverage from those wanting to catch a glimpse of what kind of condition and mindset he'll be in after the hiatus. Good for Charlotte.